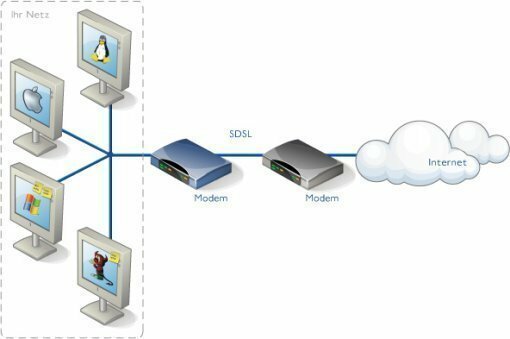 ISDN (Integrated Services Digital Network) is a system of digital phone connections that has been designed for sending voice, video, and data simultaneously over digital or ordinary phone lines, with a much faster speed and higher quality than an analog system can provide. ISDN is basically a set of protocol for making and breaking circuit switched connections as well as for advanced call features for the customers. ISDN is the international communication standard for data transmission along telephone lines and has transmission speeds up to 64 Kbps per channel. The emergence of ISDN represents an effort to standardize subscriber services, user/network interfaces, and network and internetwork capabilities. ISDN applications include high-speed image applications, additional telephone lines in home to serve the telecommuting industry, high speed file transfer, and video conferencing. Voice service is also an application for ISDN. ISDN has become a relatively old technology, but it isn’t obsolete. ISDN is a technology that is often used behind the scenes as a component of more recent technology. How Integrated Services Digital Network Works? ISDN is a broadband service provides end to end digital communication for high speed data supporting voice, video and multimedia applications. Broadband as compare to Baseband is a type of service that supports logical channels. ISDN BRI and ISDN PRI are two services of ISDN technology used worldwide. The ISDN BRI (Basic Rate Interface) offers two B channels and one D channel (2B+D). BRI B-channel service operates at 64 kbps and is meant to carry user data; BRI D-channel service operates at 16 kbps and is meant to carry control and signalling information, although it can support user data transmission under certain circumstances. The D channel signalling protocol comprises Layers 1 through 3 of the OSI reference model. BRI also provides for framing control and other overhead, bringing its total bit rate to 192 kbps called isdn 2. The BRI physical-layer specification is ITU-T formerly the CCITT 1.430. ISDN PRI (Primary Rate Interface) service offers 23 B channels and one D channel in some regions like North America and Japan, yielding a total bit rate of 1544 kbps including the PRI D Channel runs at 64 kbps. In Europe, Australia, and the other parts of the world ISDN PRI provides 30 B channels plus one 64-kbps channel with a total interface rate of 2048 kbps called isdn 30. The physical-layer specification of PRI is ITU-t 1.431. A technique called bipolar with eight-zero substitution technique is used to transfer calls through the data channels – the B channels – with the signaling channels (D channels) being exclusively used for call set up and management. Once the call had been set up, a 64 Kbit/s synchronous bidirectional B channel transfer the data between the ends, which lasts until the call ends. Theoretically, there can be as many calls as there are data channels, the choice of same or different end point not withstanding. Also, it is possible to multiplex a number of bearer channels (B channels) to produce a single higher bandwidth channel, using a process called B channel bonding. Adapter (TA). The ISDN Terminal Adapter can be either a standalone device or a board inside the TE2. If the TE2 is implemented as a standalone device, it connects to the Terminal Adapter via a standard physical-layer interface for example EIA/TIA-232-C (formerly RS-232-C), V.24, and V.35. Beyond the TE1 and TE2 devices, the next connection point in the ISDN network is the NT1 (network termination type 1) or NT2 (network termination type 2) device. These are network-termination devices that connect the four-wire subscriber wiring to the conventional two-wire local loop. In North America and Japan, the NT1 is the CPE (customer premises equipment) device. In Europe and most of the other parts of the world, the NT1 is part of the network provided by the carrier. The NT2 is a more complicated device that typically is found in digital PBX (private branch exchanges) and that performs layer 2 and layer 3 protocol functions and connection services. An NT1/2 device also exists as a single device that combines the functions of an NT1 and NT2. Followings are the some important functions or hardware of ISDN. ISDN specifies a number of reference points that define logical interface between functional groupings, such as TA and NT1. ISDN reference points include the following. R- The reference point between non-ISDN equipment and a TA. S- The reference point between user terminals and the NT2. T- The reference point between NT1 and NT2 devices. U- The reference point between NT1 device and line-termination equipment in the carrier network. 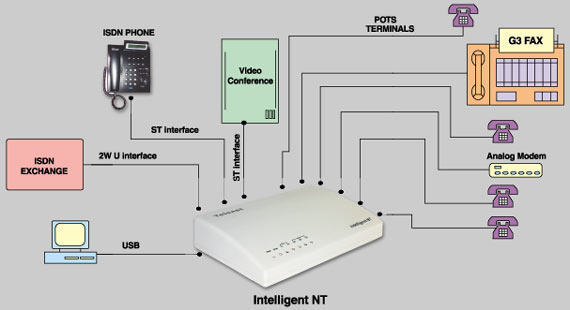 The U reference point is relevant only in North America, where the NT1 function is not provided by the carrier network. To configure an ISDN BRI-U interface first you should have to select the ISDN Switch Type with this set of commands. ISDN is an example of circuit-switched network along with PSTN dialup networking. The basic difference between ISDN and PSTN environment is that in PSTN dialup environment the local loop is based on analog signalling while in ISDN the local loop is digital. 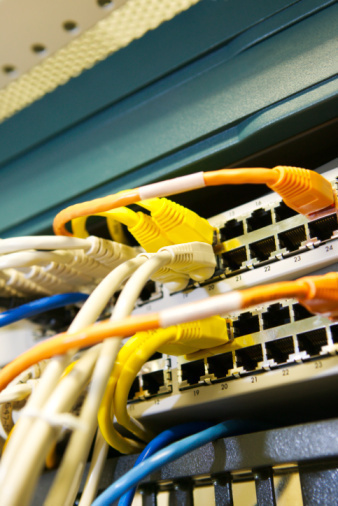 ISDN supports broadband services like DSL or IDSL that are faster than analog service as well as costly. The only disadvantage of the ISDN connection is the cost because as compare to packet-switched network such as Frame Relay and ATM ISDN is more costly. Although cheap isdn line or isdn over ip are the solutions of this problem provides cheap isdn by ISDN providers but overall you can’t say that ISDN is a cost effective service. Hey Thanks for a better understanding i did ccna routing and switching but i do not get the clear picture of isdn connection. really a good articles..makes clear about ISDN….Thanks for this information. Thanks for the article… Its Helps me to understand that what is ISDN? its too nice to understand. it is a very good topic …. 257 queries in 0.549 seconds.